The following story is adapted from the press release by Ma’am Tessa Jazmines. 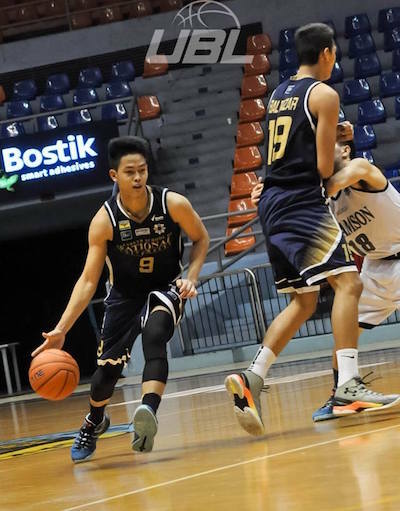 Justine Baltazar scored a buzzer-beating tip-in as National University nipped Adamson University, 68-66, yesterday in the UAAP Season 78 juniors basketball tournament at the Filoil Flying V Arena. 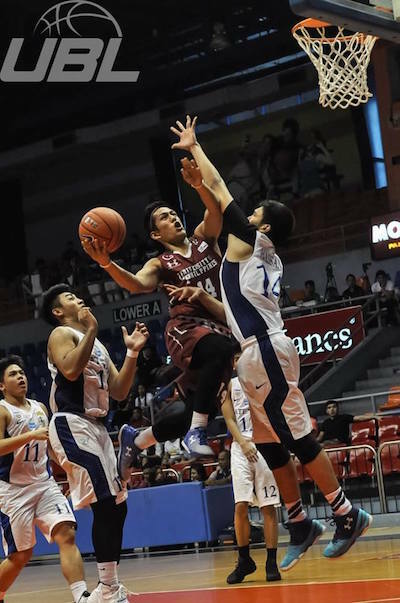 John Lloyd Clemente shot 20 points for NU, but it was Baltazar’s game-winner that spelled the difference for the Bullpups, who barely extended their perfect run to nine games. Former Batang Gilas player Rhayan Amsali added 15 points and 8 rebounds, while Baltazar had 12 points and 9 boards for NU. The Baby Falcons outscored NU, 19-12, in the final frame to put a scare in the Bullpups. Coach Goldwin Monteverde’s wards were paced by Evan Agbong’s 13 points, while Ralf Chua and Jayson Celis each dropped a dozen markers. Evan Agbong tries to stick one in the cup for Adamson. 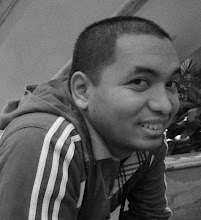 John Lloyd Clemente curls off a screen provided by Justine Baltazar. Aljun Melecio drilled in 17 markers as De La Salle-Zobel kept its hold of second place with a 78-52 drubbing of University of Santo Tomas, while defending champion Ateneo, behind Shaun Ildelfonso’s 17 points, turned back UP Integrated School, 75-67, to regain its winning ways. The Junior Archers rose to 7-2, a game ahead of the third-running Blue Eaglets, who are now at 6-3. DLSZ led by 14 at the end of the first quarter and was on cruise control till the final buzzer. Miguel Fortuna and Marcos Sario backstopped Melecio’s efforts with a combined 26 points, while promising swingman Brent Paraiso added 11 markrs, 5 boards, 5 dimes, and 2 swipes. 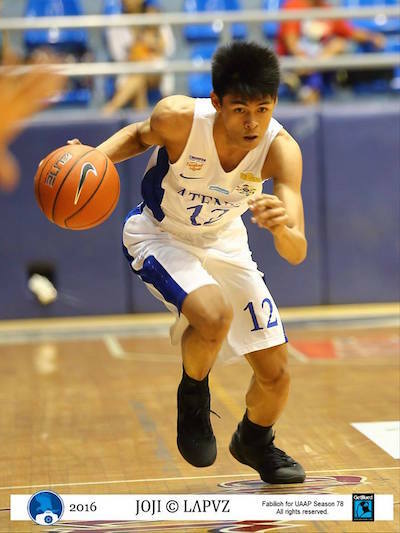 The Tiger Cubs, meanwhile, were led by Marlon Navarro’s 10 points. Nobody else scored more than 6 points for UST. 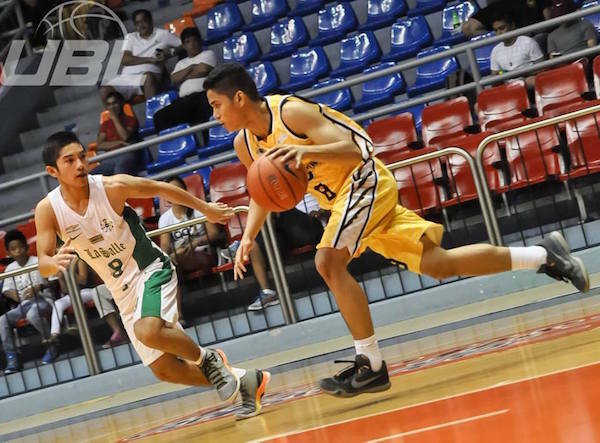 Carl Lacap tries to weave his way past the DLSZ pressure defense. Marco Sario makes a beeline to the basket. 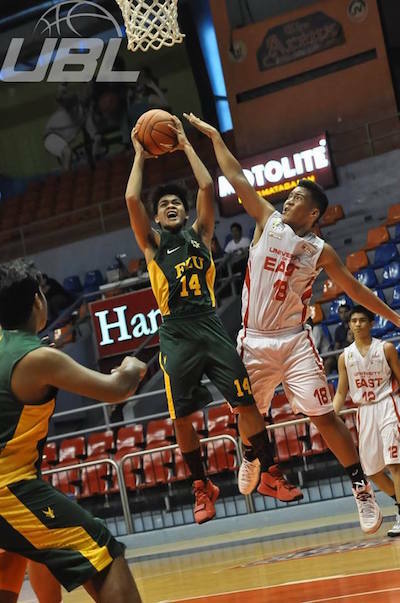 The defending champion Eaglets played sans star guard Jolo Mendoza, who was still nursing an ankle injury. 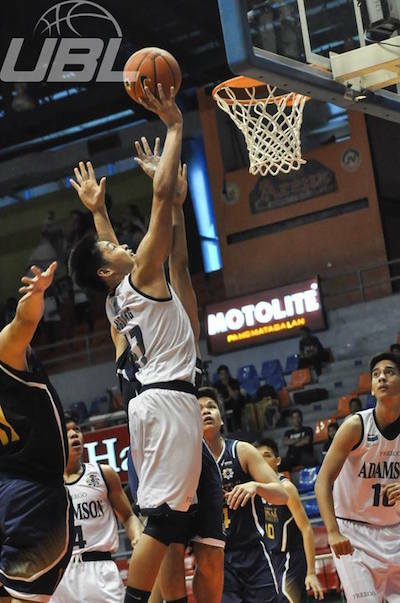 Mendoza, who is a part of the Batang Gilas U18 pool, may return to action when Ateneo takes on arch-rival DLSZ on Wednesday. Aside from Ildefonso, also stepping up for coach Joe Silva were Gian Mamuyac and Shaun’s younger brother, Dave, who tossed in 16 and 13 points, respectively. As for UPIS, Juan Gomez de Liano and Allane Barles led the way and paired up to tally a total of 40 points. Graduating forward Shaun Ildefonso recorded one of his best games so far against UPIS. Allane Barles goes up strong against Sier Hassan. 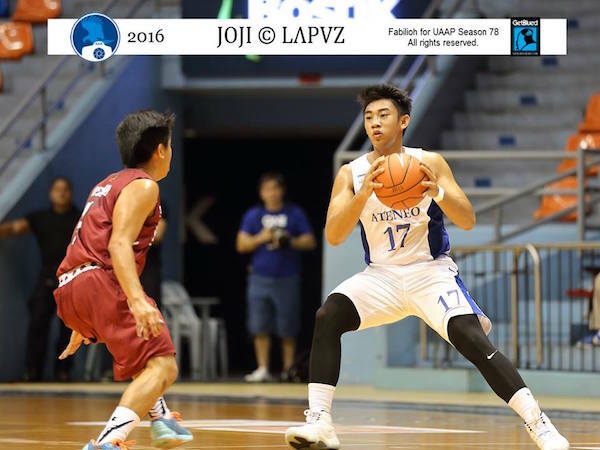 Batang Gilas stalwart Gian Mamuyac was the main man for Ateneo without Jolo Mendoza. 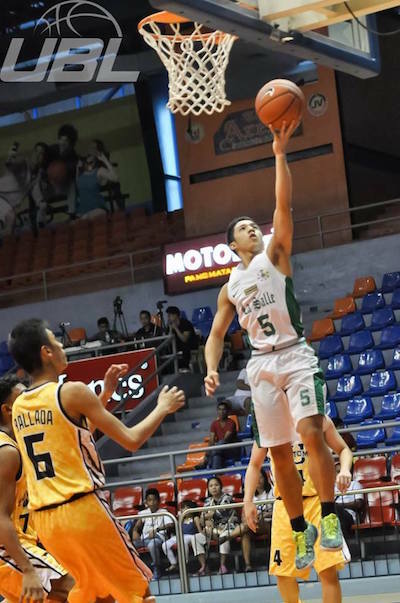 Former Batang Gilas pool member Kenji Roman recorded a 17-point, 13-rebound double-double as Far Eastern University-Diliman routed University of the East, 93-79, to gain a share of fourth place. Jack Gloria also impressed for the Baby Tamaraws with 14 points, while JJ Sapinit and Xyrus Torres each put up 10 markers. 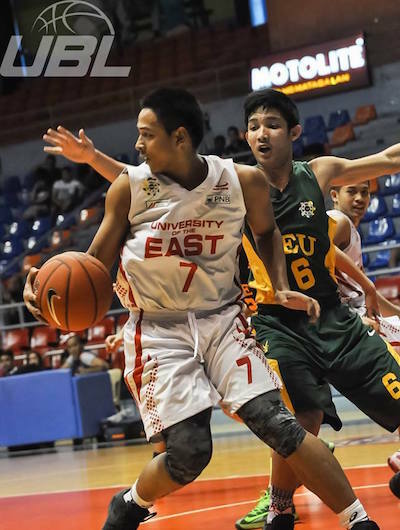 UE was led by Ernest Camarillo and Dustin Angeles, who scored 21 points apiece. The Baby Tamaraws tied the Baby Falcons at 5-3. The Tiger Cubs went down to 3-6, while the Junior Maroons and the Junior Warriors slipped to 1-8 and 0-9, respectively. Ernest Camarillo tries to spin away from the FEU interior D.
LJ Gonzales rises for the undergoal stab against UE. Unless otherwise specified, all images are from the University Basketball League (UBL). 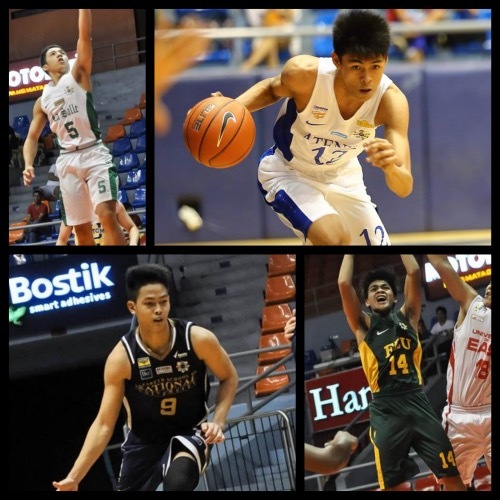 FOR MORE UAAP SEASON 78 JUNIORS ACTION, CHECK OUT THIS LINK!